"My name is Selma Beganovic. I recently joined iSBio as a PhD student. I work in a project team, which is dedicated to systems metabolic engineering of microbes of the genus Streptomyces, producers of natural compounds with applications in human health and well-being. Personally, I feel that these endeavors are particularly relevant in light of the struggle of human mankind against a constantly increasing antibiotic resistance. My own efforts are directed towards developing superior producers of Streptomyces rimosus, an industrial strain for oxytetracycline production. Being a part of a team, which is setting a milestone in production of novel bioactive compounds feels extremely inspirational and motivational. I am very grateful to my new colleagues in making acclimatization to this new stage in my professional career so smooth and pleasant. It is really great to be be part of iSBio." Selma Beganovic has graduated in Molecular and Plant Biotechnology at TU Kaiserslautern. 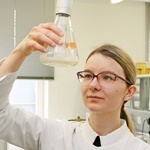 Since October 2018, Selma is a PhD student in the European project "MISSION", funded within the ERANET initiative CoBioTech and works on systems biology and systems metabolic engineering of Streptomyces rimosus.